Yesterday, I came home to a package left on my bed. Since my birthday was almost a month ago, I wasn’t expecting to see a present in the mail. It was a gift from a dear friend and big supporter of my “Recipes From Molly” adventure. What a lovely surprise! I opened the outside wrapping and saw brightly colored birthday paper and a card. I always love to open the card for gifts first and try to guess from the message what the wrapped gift might be. In this case, the card was equally wonderful to the thoughtful gift I eventually opened. It was a hand drawn card depicting a lady bug drinking Dom Perignon and having a picnic containing a wonderful and encouraging message about my food journey. A very Molly card indeed! The gift was just as good (okay, almost…but how can you top a bug card, really?). 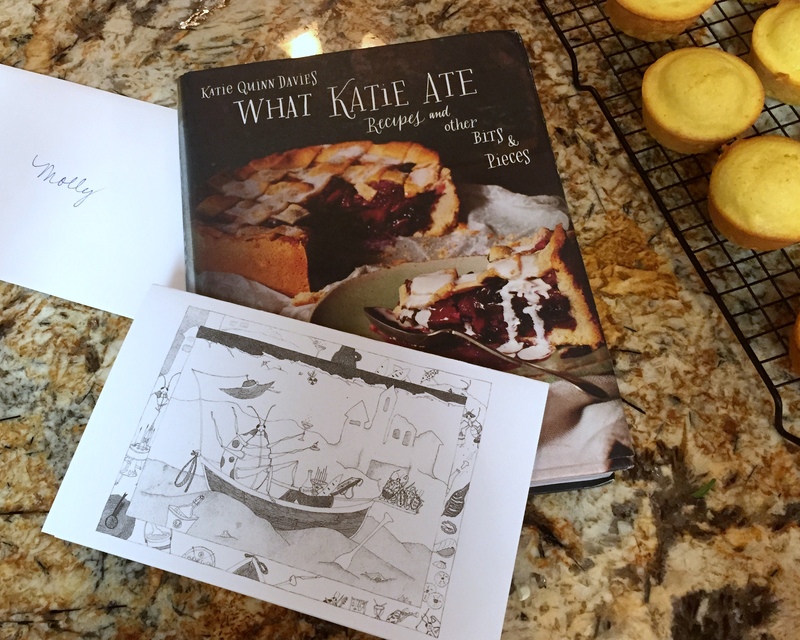 Another cookbook for my collection: “What Katie Ate”. I have been lusting after this cookbook for a while now. The idea of starting over and making a career out of a love of sharing food is so appealing to me. Who knows, maybe one day Recipes From Molly reach and inspire just as many people. I sure hope so! Buoyed by the happiness of knowing that there is a group of wonderful people out there who support and encourage my endeavours, I set to cooking a meal that would live up to the gorgeous images I had been looking at so lovingly in my new book. 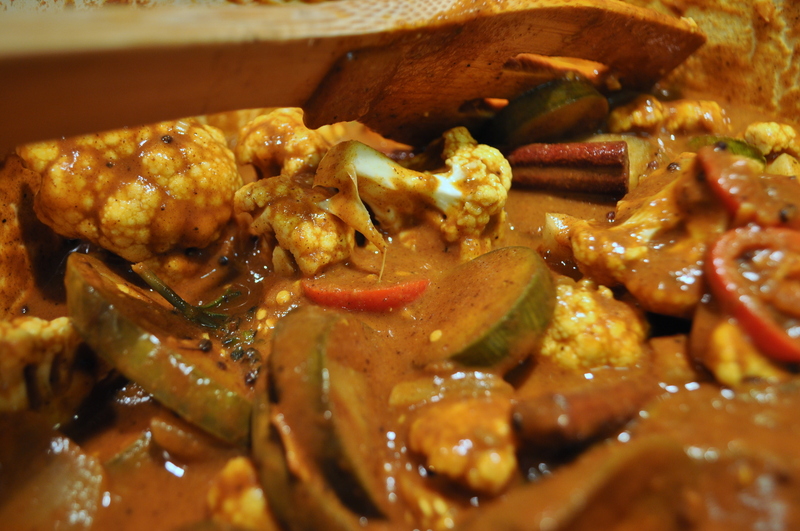 This Eggplant and Cauliflower Curry is a combination of many food memories and loves. It is partly my mother’s cauliflower curry from my childhood, partly the eggplant dishes I have come to love here in Hawaii, and all made with the love of a new dish. I was able to use eggplant from my garden and spices collected across the country by more people I love. It was even cooked in a pan given to me by a dear friend. This is a dish that is very close to my heart…via my stomach of course! While many curries are hot and spicy, this dish is mild enough for even the most spice averse. Don’t be fooled by the jalapenos, they cook down and only impart a hint of spice. This curry is spicy in a flavorful way, not in terms of heat. Feel free to improvise on the vegetables. I LOVE cauliflower so it was a must for me but you could use another firm vegetable in its place. One of the dishes that inspired this one, my mother’s cauliflower curry, is made with potatoes, chickpeas, and cauliflower. That is a wonderful combination! Get creative. If you don’t have some of the spices, use the ones you have. Everyone has their own version of a curry powder anyway so, really, you are just making the dish your own when you change the spices. I hope this recipe gives you as much happiness as it gave me. Not just in the food itself, but in the memories it will become and those that it evokes. A big dish of delish! I love it! Thank you so much. 😊 Maybe one day…I need to have a LOT more recipes first! I have never seen a recipe like this! and I trawl blogs aaaall the time. I hope that is a good thing! Haha 😀 enjoy! This looks so fantastic!! I looooove cauliflower. Will have to give this a try! You know this looks so awesome. I’m a big fan of eggplant, too. Thanks for linking up and sharing your recipe with us at Funtastic Friday. I hope you join us again this week.